Many American volleyball players have an opportunity to play club ball overseas after their NCAA careers are over, but it’s hard to get a contract unless you know how to get a team’s attention. Here’s your guide. This is the second article in the Art of Coaching’s series on how U.S. indoor volleyball players can boost their chances to earn foreign club contracts. Our expert on the subject is Andy Inveiss, a San Diego-based attorney and founder of SportsNet International. 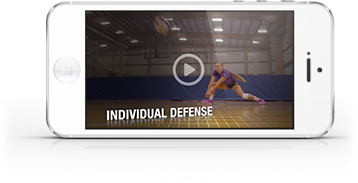 Inveiss has represented volleyball players and coaches since 1987 and negotiated over 350 international contracts and another hundred or so contracts for U.S. national team players. Our first article on this subject, Spiking for Dollars, covered which positions are most coveted by foreign club teams and which countries offer the best playing opportunities. The starting point in anyone’s quest to play volleyball for money on a foreign club team is self-evaluation. “It’s important for players to honestly access their skill level and match their skill level to potential clubs that will consider their services,” Inveiss says. When you’ve found the level that fits, go to the Internet and begin your research. 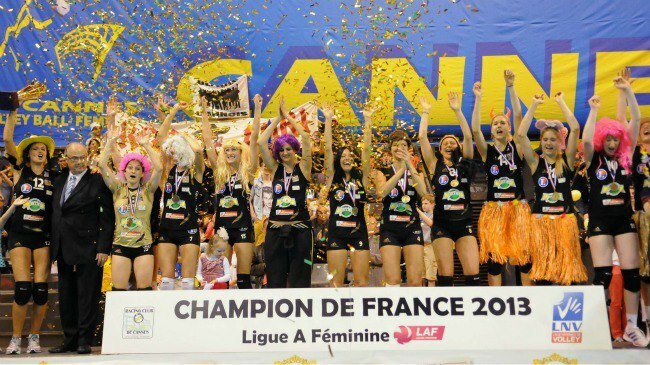 Most foreign club leagues have websites with all their teams listed. Once you get team names, you can search for individual team emails and coaching contacts. As you can see, these sites are written in the home country’s language, but one click of Google translate puts it all in English for you. Facebook is a good way to connect. Most players are happy to talk about their experiences with another high-level volleyball player. There’s no better way to get information than to talk to someone who has already been there and can give you the pros and cons. Be sure to ask specific questions. Did you receive all your money? What were the cultural differences? How was the food? How much help did the club give you when you needed help? 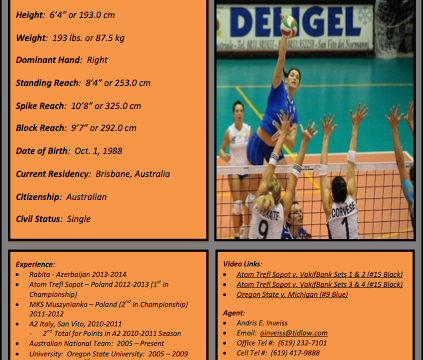 To give you an idea of what a good volleyball resume looks like, Inveiss has shared one from a client of his, Rachel Rourke, an Oregon State graduate who plays for Rabita – Azerbaijan, a top foreign club. Note that Rourke’s resume is clean and simple, just one page – and just the essential facts. Obviously, your volleyball accomplishments are what make your resume stand out. There’s no substitute for USA national team experience. If you reach that level, include it prominently on your resume, and mention how many months you were with the USA program and which tournaments or matches you played in. Experience level: Where you’ve played and when from college on. Key statistics. Were you one of the country’s leaders in college in certain stats? If so, include that. Top 10 in any category is good. If you had a few great matches, put those down, too. And any kill, serving or passing percentages that stand out and indicate that you have distinguished yourself at the highest level of the college game. Include two matches. Send videos of entire USA matches or, if you don’t have national team experience, two good college matches. Don’t include cakewalk matches where your team crushes a weak opponent. Coaches want to see that you can perform against quality competition. Select matches where you start strong. Attention spans are short. A coach isn’t going to watch an entire video waiting for you to get hot in the third game. Include a link to your videos in your resume. The easier you can make it for foreign coaches to see how good you are, the better. Everybody has a favorite coach, but your favorite coach – or even the coach who knows you best – may not be your best reference. References who carry the most weight are coaches who are known in the international community. If you’ve spent time with the U.S. national team recently, you’ll obviously want to include Karch Kiraly (head women’s coach) or John Speraw (head men’s coach) as a reference. College players whose coaches aren’t well known should try to get references from a name coach who they’ve played against. Coaches like Penn State’s Russ Rose or Stanford’s John Dunning or Oregon State’s Terry Liskevych (Terry coached the U.S. women’s national team at three Olympics) are well known in international volleyball circles. A good word from coaches like that can be a big help.